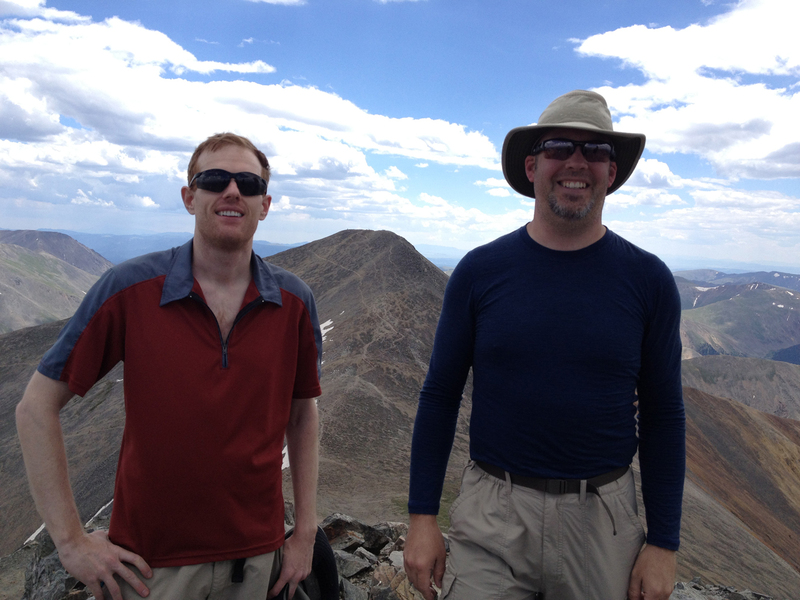 July 20, 2013 – I made the summit of Grays Peak (14,270 ft.) and Torreys Peak (14,267 ft.) – a double combo with my cousin John McDowell. My Dad Jerry McDowell and Uncle Keith McDowell did not attempt this combo. After a really long day summiting Pikes Peak yesterday, we got our start on this double combo at 8:19AM. It is Saturday so the trail is full of hikers of all types. As we come up around the bend a bit on this nice easy paced beginning we see the Grays and Torreys peaks in the distance ahead of us. The weather is really gorgeous and stays this way all day. As we get near to the end of the approach hike the two peaks really start to come into view. It’s near impossible to see in the video, but we can see tiny specs of people making the climb. It’s almost a mental kick in the pants… you mean I have to make it way up there?! Yes, definitely. Don’t psych yourself out. We’re about to start the steep ascent on some rocky terrain. The song “Break My Stride” by Matthew Wilder ends up stuck in my head for a little while. If you clicked the link, be warned, it’s like the worst video… EVER. And so, while our quads are screaming at us after doing Pikes Peaks yesterday, we just keep on pushing up the steep slopes of Grays Peak up to the summit at 14,270 ft. Did you catch the sign in the video where we hit summit? Someone put up a sign and spelled it Greys instead of Grays! HA! Greys Peak is in Nevada, not the same place. Stupid sign person. At the summit we relaxed for a few minutes, had some gatorade, had a snack and such. I searched all over looking for the USGS medallion, but there is not one on Grays OR Torreys. I was slightly disappointed as I had a medallion photo from the 3 previous summits. After our break we headed down the trail towards the saddle between the two peaks. 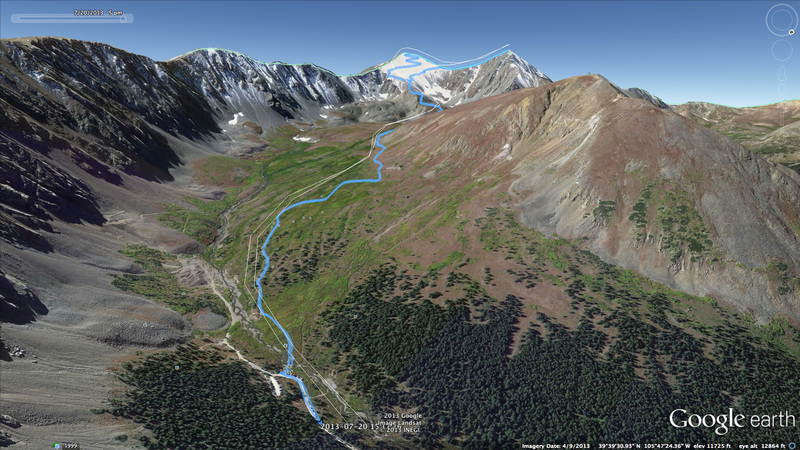 Going down is a nice relief honestly… but we have to go back up again to hit Torreys and the summit trail looked steep! Of course, after making Grays, there was no stopping now! The trek up to the top of Torreys is definitely no joke. It’s steep. Put one foot in front of the other and keep on going up. So for the 5th time in 4 days I reached the summit of a 14er! A couple ladies at the top were impressed, and it did feel good! John came up just a couple minutes after me since I came down into the saddle off Grays a bit faster than he did, but it means I got to catch him on video reaching the summit. We stopped to have another small smack and rest. While hanging around Torreys summit I hear a gal ask if anyone has a bandaid. I carried my first aid kit with me so I spoke up. Thankfully the photo is blurry, but since I actually had to use my first aid kit, you might as well see why. 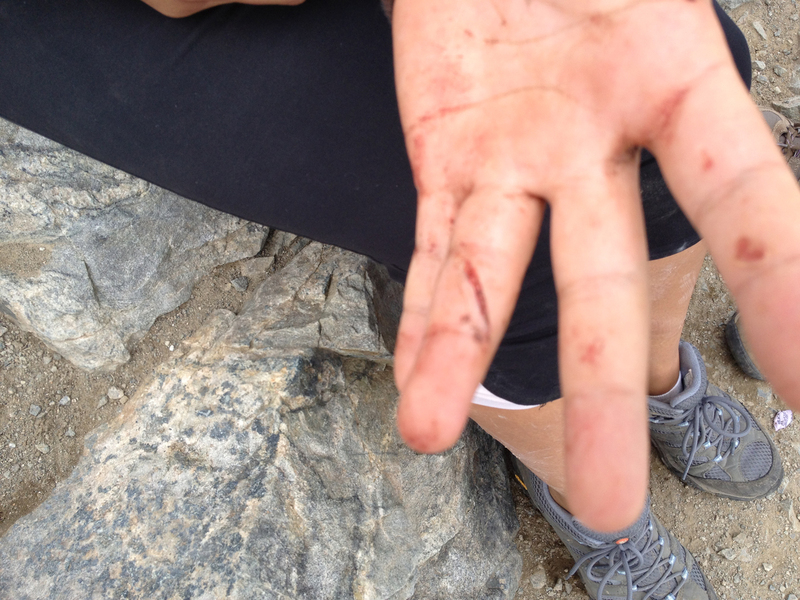 She fell on the way up the back side of Torreys and sliced her finger… it’s gross. I didn’t have any butterflies in my kit so we pulled it together with a bandaid and wrapped some tape around it to help hold it in place. She’ll probably get some stitches when she makes it down and to a doctor. She was worried about the bandanna she had been using to stop the bleeding. I had to remind her a bandanna costs $5 while she’s priceless. She was otherwise OK and in good spirits. Time to head off the double combo. I decided since I was going downhill faster, I asked John if he cared if I just met him at the car and he handed me the keys and off I went at my own pace. Of course as I got back down into the saddle on the way down, I got another song stuck in my head, “Back in the Saddle Again” by Aerosmith. A much better song than the previous, but alas, no interesting video to go along with the song. On the way down we got to cross a small bit of snow. And yes, even in mid July, snow is still slippery and I stumbled a bit while making a video. I kept my fast pace of going down, using my arms like rudders, like a bird would use its tail. Which brings up a point… I did NOT take my trekking poles on the hike today and I have decided I will not be taking trekking poles to Kilimanjaro. On previous days when I wanted to tuck them on my pack and put the rain cover on it, they would have just poked holes in the pack. When I wanted to go down, they just caused me to go slow. I’ve really enjoyed my poles on low land hiking, but for big mountains, I’m not sure I’ll use them again. I’ll just have to see how that pans out, but no poles on Kili! Since I was going down so fast, I remembered crossing a stream on the way up, so what did I do? I took my GoPro and filmed myself walking forward just like you’ve seen through most of the video. But then, I turned around, put the GoPro IN the stream (waterproof cover), backtracked, then hiked again on the same path so the camera would capture me crossing the stream from underwater. Yup… I did that. Finally, the end of the hike. It was a tough day, really tough on the quads. Basically the brain just had to override them and keep on going. These five peaks were tough challenges and awesome to summit but I also couldn’t wait to get back home to my friends in NC.